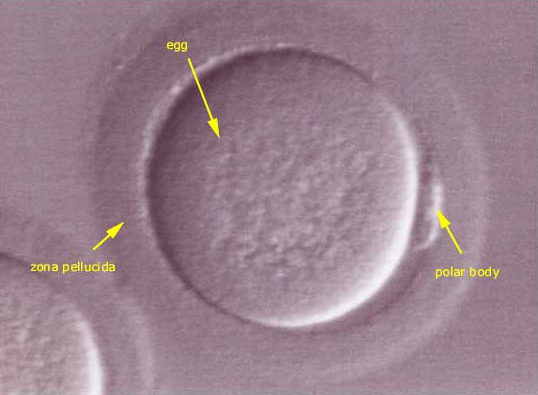 Photomicrograph (microscopic view) of a human egg that has extruded one polar body (at 3 o'clock position), signifying the completion of meiosis I. Human eggs arrest during development in the metaphase stage (second stage) of meiosis II (MII), at which point they become fully fertilization capable. If fertilization does occur, meiosis II is completed and a second polar body is extruded. During In Vitro Fertilization (IVF) the MII eggs (mature eggs) are often inseminated with sperm 3-5 hours after retrieval from the ovary.